LARUS has always been an innovator company and one of its purposes is to deliver to the customers software solutions that can integrate different technologies to enable business pursuing its own targets. This idea brought the company to establish a long-term partnership with Neo Technology, the company behind the most important Graph Database in the world: Neo4j. As you might know, Neo4j isn’t the only database belonging to the NoSQL landscape: as a Document database, Couchbase is included in this category as well. “Moving from a pure relational database persistence solution to an approach using polyglot persistence is the key to solve dedicated use-cases effectively. Each database handles its chore best, e.g. data volume or complexity and their combination provides the best of both worlds for application development productivity and efficient large-scale data management. At LARUS, we have been adopting this paradigm for customer projects for several years. Being a Neo4j Solution Partner allows us to add the graph capability to our solutions. While working on many integration projects we see the need for well engineered connectors, because combining different databases means you need a working data-synchronization and communication solution“. By studying the mapping strategies defined in the existing Neo4j-MongoDB Connector (yet another Document database), Mauro Roiter (@mauroroiter) and Riccardo Birello (@riccardobirello), with the inestimable support of Michael Hunger (@mesirii), caretaker of the Neo4j community and ecosystem at Neo Technology and Michael Nitschinger (@daschl), lead developer of the Couchbase Java SDK, started the development of the new Neo4j-Couchbase Connector. The peculiarity of this connector is that it provides a sound and performant bi-directional integration between Neo4j and Couchbase to map selected documents and their updates to normalized graph structures in the one direction and also sends graph updates to be integrated into documents in the other direction. 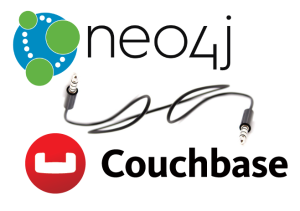 Following its own Open Source philosophy, LARUS is of course developing this connector as a public project available on Github, here: https://github.com/larusba/neo4j-couchbase-connector. ⟵Neo4j JDBC Driver 3.x: Bolt it with LARUS!